Apple cider vinegar has become incredibly popular as a panacea for almost any health condition in the 21st century. Unfortunately, many of these claims are nonsense and not backed up by science. It is definitely healthy, however, and scientists have identified and verified several of its health benefits. 1) Apple cider vinegar is a natural form of a substance called acetic acid, which is, according to a study published in the journal Burns in 2009, a great antibacterial substance for use on your skin as an alternative to common antiseptics. You can also use it to disinfect kitchen counters or to wash meat and vegetables after mixing it with water. 2) For diabetics, Italian scientists demonstrated in the European Journal of Clinical Nutrition that acetic acid could lower blood sugar, even if consumed in small quantities like in salad dressings. Not only does it improve blood sugar, but another study in Diabetes Care also shows that it can reduce post-high carbohydrate meal insulin sensitivity of diabetics by 34%. 3) According to a study in Bioscience, Biotechnology, and Biochemistry, acetic acid can lower the blood pressure by up to 20 mmHg if you drink one or two tablespoons in a glass of water daily. 4) While it is important not to overstate the effects, it seems as if the acetic acid has antitumor qualities. In one 2004 study in the journal Biofactors, researchers showed that it could kill leukemia cells when applied to such cells in the laboratory. Another research team who applied it to several types of human cancer cells in the laboratory showed in Journal of Experimental & Clinical Cancer Research that it could inhibit the proliferation of human cancer cells. 5) While no studies have proved that it causes weight loss, there is evidence that it makes you feel fuller. In a 2005 study in the European Journal of Clinical Nutrition, Swedish scientists showed that people who ate bread with vinegar felt fuller than people who ate the bread alone. This may help you eat less and, thereby, lose weight. 6) While no studies on humans currently exist, a 2006 study on rats in the British Journal of Nutrition shows that dietary acetic acid can lower total cholesterol in rats fed a diet containing moderate amounts of cholesterol. 7) If you want to help your body build a diverse collection of gut bacteria, which is healthier than having too much of the same type, Apple cider vinegar contains many different types of bacteria, according to a study in the International Journal of Food Microbiology. 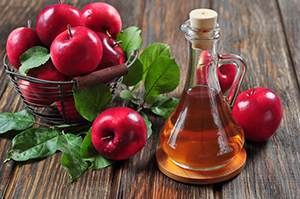 To take Apple cider vinegar safely, never drink it straight. Mix 1 tablespoon or a bit more with one glass of water. If this makes you feel sick, a common complaint, buy empty capsules, scoop the vinegar into them, and swallow the capsules. You will need many capsules per day, as each contains so little vinegar but since it bypasses your acid-sensitive esophagus, you don’t have to mix it with water.